The TFS Woodstoves shop on Chobham High Street has a range of wood burning and multi-fuel fires on display. Needless to say if you pop in, you will be nice and warm. 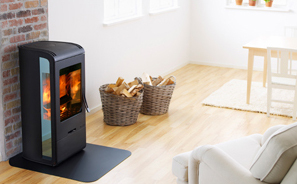 If you are entertaining the idea of a wood burning stove then this is definately the place to come for expert advice as TFS have installed literally thousands of woodstoves from a range of manufacturers in some very diverse properties. If you have an existing fire or woodstove, but think it may be time for a change or an upgrade, TFS have the most modern fires available, that burn the wood not once, but twice, to generate even more heat than traditional fires do making them a much more economical (and greener) option. If you don't have a fireplace or a chimney, but want to explore the idea of having a fire then TFS can help. We survey, design and plan and have fitted fireplaces and fires and woodstoves, that do not need a fireplace.